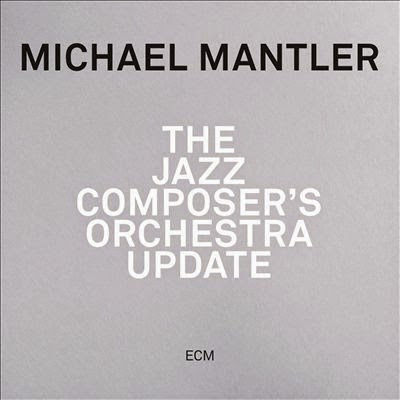 Michael Mantler’s original Jazz Composer’s Orchestra recordings of 1968 were a landmark in large-group composition and improvisation. Mantler has revisited this body of work with a new ensemble including Harry Sokal on tenor sax, guitarist Bjarne Roupé, alto player Wolfgang Puschnig, pianist David Helbock, the Nouvelle Cuisine Big Band conducted by Christoph Cech and radio.string.quartet.vienna. The original recording featured a heady mix of frantic all-out improvisations from the likes of Keith Jarrett, Larry Coryell, Pharoah Sanders and Roswell Rudd alongside closely scored passages for a huge ensemble featuring nearly a football team of double bass players alone. While digitising his archive, Mantler found himself excited once again at the work and wondering how to give it a new life. Rather than attempt the impossible and re-record it, Mantler has produced an ‘update’ – keeping the ensemble instrumentation (but reverting to a single bass), and working with the amplified radio.string.quartet.vienna to bring a new voice to the string parts. The result is a genuine update. Some of the pieces are instantly recogisable from the 1968 album, others are extensively revised. Yet other pieces date from the same period but didn’t make the original double album. The recognisable pieces are perhaps more restrained than their 1968 counterparts, with shorter and less bone-shakingly intense improvisations allowing the ensemble and writing to come to the fore more coherently. Update Ten, for example, starts with the same dark and soulful atmosphere with bass solo before Sokal take a turn on tenor saxophone (a very different and more melodic take than Roswell Rudd’s rasping trombone). The ensemble leads into a beautifully written passage subsiding into more bass. The two-part ‘piano concerto’ for Cecil Taylor has been condensed here into Update Eleven, a shorter work featuring guitarist Bjarne Roupé – again the ensemble work taking a new presence, with Roupé proving himself well up to the task. The ‘new’ works stand up well within this environment. Mantler himself provides a fine trumpet solo on Update Six and leads the way into Update One. Only in the culminating three-part Update Twelve does the improvisation reach the same kind of level as the original, with sharp and tight backing all the way. These takes were recorded live at a performance at Vienna’s Porgy & Bess club in 2013. The recording quality is excellent, allowing the full spectrum of voices to emerge easily and clearly. The original JCO landmark recording has a definite sound ‘of it’s time’ to me today. Update is really what it says – not a reproduction or look back, but a new take on this music that shows something of what we’ve learned in the best part of half a century. This unique counterpart album is quite simply required listening for anyone with a scintilla of interest in large-scale modern jazz. "The two-part ‘piano concerto’ for Keith Jarrett has been condensed here into Update Eleven .... "
no Keth Jarrett there, ever ... that was Cecil Taylor! Yes, thanks you Anonymous - brain fade in my part. Oops.